Are you putting together a sports camp or clinic this summer? You’re sure to have a fun time helping children learn about soccer, basketball, lacrosse, volleyball or your favorite sport. Try these tips to help with your advanced planning. Give yourself plenty of time to plan your camp or clinic — especially if this is its inaugural year. Think through these logistics. Enlist Help - Two — or even three — heads are better than one! Recruit others to help with the organization phase of setting up the camp or clinic. 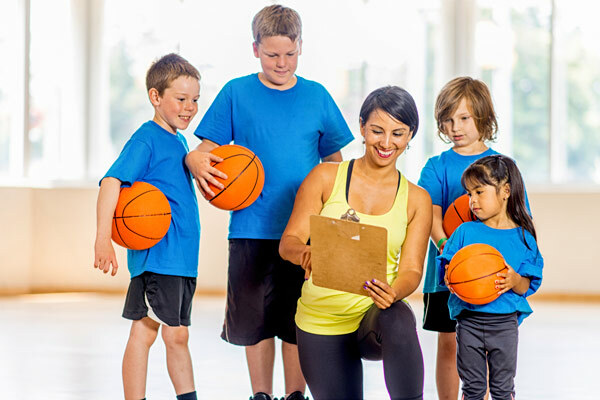 If you can get help from an experienced coach, athletic director or someone else involved in youth sports, you will benefit greatly from their experience. Secure a Location - The size of the fields or gym space will help you to determine how many participants you can accommodate. You will also want to know the price of your location for budgeting purposes. Determine the Goals of your Camp or Clinic - Are you going to focus on fundamentals? Stress the importance of teamwork? Focus on physical fitness? Having goals will help you recruit people who are interested and will also serve as a guide when it comes time to plan your clinic activities. Create a Budget - Do you have to pay for gym space? Will you need to pay for employees such as referees? Equipment? Uniforms? Awards? Once you determine a budget, you can begin the next phase. Solicit Donations - Asking for donations to help offset the cost of the camp will help to keep your prices affordable. Sports-related or community-centered businesses are often willing to make a donation in return for advertising. You can include their name on T-shirts, programs or fliers. Set Pricing and Age Parameters - Research other local camps and organizations that offer similar services before making final decisions on your target age and your price. Try to find the sweet spot of the market. Once those goals are set, you are ready to start recruiting for your camp or clinic. 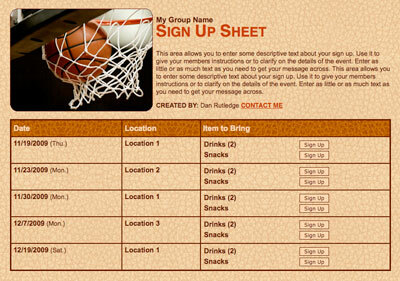 Register Participants - SignUpGenius makes it easy for participants to sign up and pay for a spot at the camp or clinic. When participants sign up, make sure to ask for age, ability/experience level, shirt size, relevant medical information and emergency contact information. Recruit a Successful Role Model - If you can find a professional athlete, or even a successful college or high school level athlete who is willing to come speak to your campers, it will go a long way to attracting young participants. Collect summer camp registrations with an online sign up! SAMPLE. As the date of your camp or clinic gets closer, you still have more planning to take care of! You will want to check these items off your to-do list several weeks before your start date. Create a Schedule of Activities - The more organized you are, the better! If this is more than a one-day camp, then you may consider a daily theme created around a particular skill or goal. Make sure you leave time for water and snack breaks. Recruit Volunteers - Now that you have your camp events set, decide how many volunteers you need, and then make sure you have more than enough! Consider contacting local high schools to recruit older athletes who want to get in volunteer hours to meet school requirements. Order Uniforms - Uniforms or T-shirts in various colors will help to organize the children into groups or teams. They will also be great advertising for you when the participants continue to wear them throughout the summer! Order Awards or Trophies - Make sure the awards fit your goals. While you will want to give awards for winning, give awards to your campers for other things as well. If building character through teamwork is a goal, then give an award for that. Purchase Equipment - Balls, cones, nets, whistles, clipboards, stopwatches, coolers, field lining paint … it’s time to start gathering everything that you will need to make your camp a success. Genius Tip: Want people to donate supplies? Organize an online sign up with your wish list. Your camp or clinic date is quickly approaching! Here are some organization details to take care of the week before your camp or clinic. Send a Reminder Email - This email can serve as a reminder and can also let the participants know more information about the clinic schedule. Assign Volunteer Responsibilities - Check in with all volunteers and let them know their responsibilities. It’s a good idea to have a “floater” who is not assigned to a particular activity but is ready to handle any unexpected situations as they arise. Put Together a Cheat Sheet - Once you’ve planned out your schedule, make sure it’s handy on a clipboard or mobile device — somewhere you can check quickly to make sure the flow of camp never lags. Prepare your First Aid Kit - Make sure your first aid supplies are in order, and let all the volunteers know where to find the first aid kit and ice for any injuries. Create an Alternative Plan for Rainy Weather - If you are hosting an indoor camp, then no need to worry about this. However, if you are planning an outdoor camp then you are at the mercy of Mother Nature. You need to create a back up plan with either an indoor space or rain date alternative. Develop a Conflict Resolution Plan - Ideally all of your campers will get along and your camp will be completely conflict-free, but you will want a plan in place just in case. Having volunteers prepared to handle conflict appropriately will help to teach your campers valuable life skills for resolving future conflicts. Clinic day/week is finally here! Here are a few tips to help your camp or clinic run smoothly. Have a Signal - Your campers will be spread out across a field or gymnasium, so you will need to get their attention to signify the beginning or end of an activity. Clapping out an easy rhythm works well (think BOOM-BOOM-TAP), because the campers can join in and help with the signal. Assign Team Names - If you are dividing into groups or teams, let the campers name their teams. It will get them interacting, and help promote teamwork and camaraderie. Stay Positive - No matter the skill level of each camper, make sure that all the volunteers know that praise for both achievements and efforts will help campers learn and enjoy the sport. Stay Hydrated - Don’t skimp here! Have plenty of water on hand for thirsty campers and volunteers. Measure Progress – Campers are there to improve their skills, so provide some type of benchmark at the beginning of camp versus the end. This could be how quickly they can navigate a skills course or how many shots they can make in a time limit. Document with Photos or Video - It will be great to have pictures or video of your campers in action for follow up emails or if you want to create a brochure or website for your annual event. 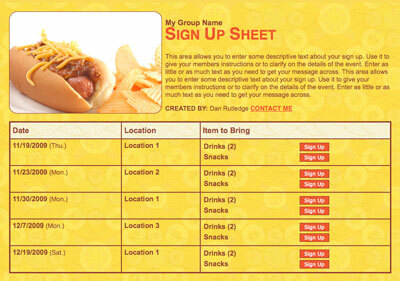 Schedule a team concessions stand with an online sign up! SAMPLE. After your camp or clinic is over, there is still some final work to be done! Here are a few tips for a great finish that will set you up for success in future years. Thank Your Volunteers - Make sure to formally thank your volunteers and let them know how vital they were to the success of your camp or clinic. Be sure to include everyone who was a part of making your clinic happen, including your sponsors and the people who made it possible for you to use the fields or gym. Send Evaluations - Depending on the camp’s size, you could offer to do this for all children or as requested. Basically, this will give campers and their parents a sense of their best skills and the areas they could still use more work. Ask For Feedback - If you hope to run this same camp or clinic next year, then follow up with parents. Send out photos of fun camper activities, and ask for feedback about what they liked or didn’t like. Consider a Friend Referral - If year one was a success and you would like to grow your camp or clinic, then consider a discount for any returning campers who invite a friend to join them next year. Sports add so much to the lives of children, keeping them physically fit, teaching them important life lessons and improving self-esteem by building their athletic abilities. Coaching them along the way is an invaluable service you can provide. 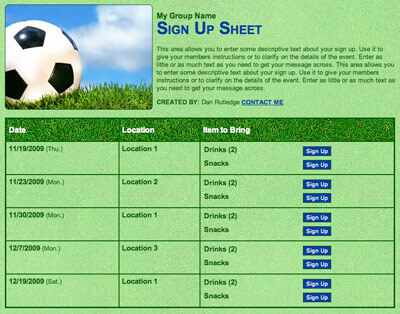 Organize a sports potluck with an online sign up!